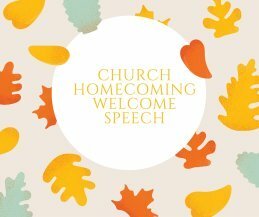 Looking for welcome for church homecoming service? Thank you for landing in our page for help. Through the grace of God we shall be of service to you. If you don't find here what you are looking for then we are working out for you to make sure you get it. Here is a sample for welcome for church homecoming service. The__________________________________family is very glad to welcome you to this homecoming service of our ______________(put the anniversary here) and want to to thank God for the mercies shown to us. We want to thank you for finding time to come and grace the occasion. The church has lined up very many activities during this day and we are sure the Holy spirit shall guide us until we finish well. Feel welcome at home and may the love of God be with you always. Make sure you celebrate the achievement of the church since it was started and where you are headed to as a church in the next few years. The above welcome for church homecoming service is just a sample to give you a true picture of what you expect and need to be done. In our page we make sure you get what you are looking for. Our mission is to save you that precious time you looking for that will help you do what you love most. Don't worry of what you want to speak before the congregation during an occasion in the church. We are you partner in the progress and value you very much. Actually,we are dealing with all church speeches and letters that you want to use to thank your guests and others for attending an occasion in the church. We urge you through the mercies of God that you make this center your partner in getting church speeches. We understand what churches need and always produce the highest quality speeches and letters for all occasions in the church. This welcome for church will also serve you better. Brethren in Christ,I greet you in the name of Jesus the Lord,good morning? We know the presence of the Lord is with us and shall guide us until we finish. May the Love of God bind us together as we spread the gospel and do the command of our Lord Jesus. Thank you for coming and God bless you all.